By converting online content to Adobe PDF using Acrobat CS6, you can capture content from a website. Because web content can change rapidly, you can capture something that may not remain online for a long period of time. You can convert things, such as news stories or business information, from a website into PDF. Because PDF files can easily be combined together, you can merge a PDF from a website with other PDF files, such as spreadsheets, word-processing documents, and brochures. If you want to convert only a single page and are using Internet Explorer, click the Convert web Page to PDF button. This step converts the current web page to a PDF. At the time of writing, Convert web Page to PDF was not compatible with the current version of other major web browsers other than Internet Explorer. From the Acrobat main menu, choose File→Create→PDF From web Page. In the URL text box, enter the URL for the website you’re converting to PDF. Click the Settings button to open the web Page Conversion Settings dialog box and see accepted file types and change PDF settings (on the General tab). 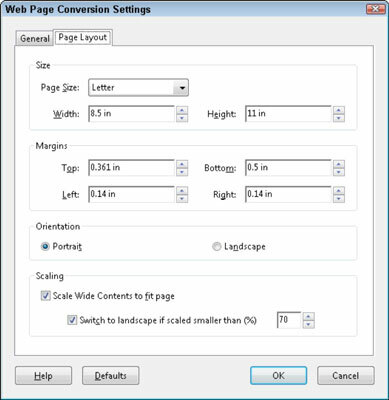 On the Page Layout tab of the web Page Conversion Settings dialog box, make changes to page size, orientation, and margins if the web page requires a wider or longer layout. When you’re done making changes in the web Page Conversion Settings dialog box, click OK. In the Create PDF from web Page dialog box, click the Create button to generate a PDF. When the download is complete, the web page (for the entered URL) selected appears as a PDF document, with hyperlinks (links to other pages within the site) intact. When you select links on the converted web page, you can open the linked page either in Acrobat or the web browser by making your choice after clicking on a link.